In light of much higher property reassessment notices from DeKalb County, a number of people have asked Ernst Legal how to appeal their property tax assessment. To begin the process, you must submit your appeal before the deadline. Check the upper right-hand corner of your DeKalb County Property Tax Annual Notice of Assessment for the deadline by which your appeal must be filed. 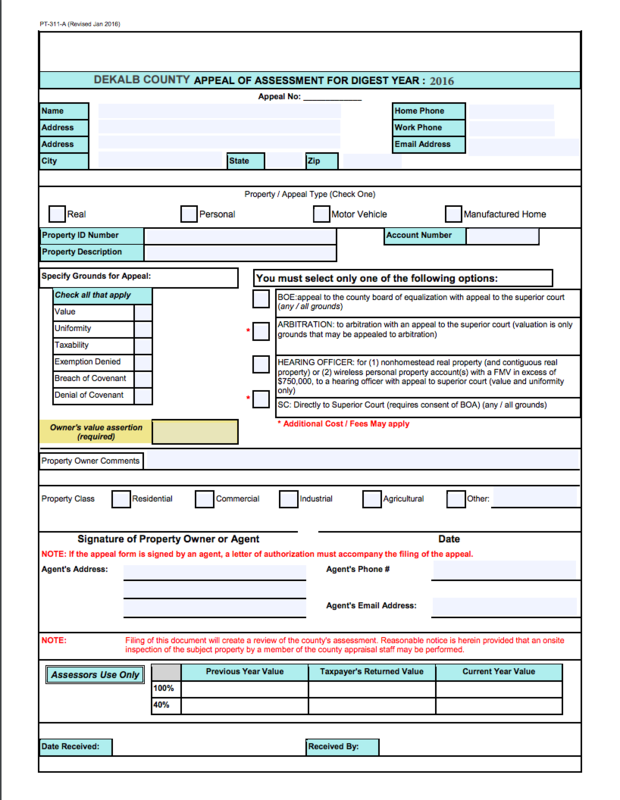 Download a copy of the 2016 Real Estate Appeal Form. 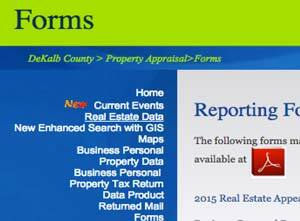 Visit the DeKalb County Tax Commissioner’s website and download a copy of the 2016 Real Estate Appeal Form*. *You’re not required to use the form, but it’s convenient. It may also be helpful to print two copies of the form. Fill out one copy of the form, check for any errors or omissions, make any necessary corrections and then fill out the final copy which you will send to the county. 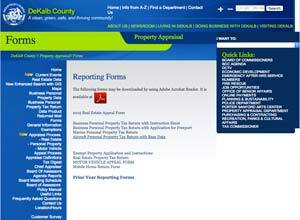 Access the DeKalb County Property Appraisal Overview for your home. 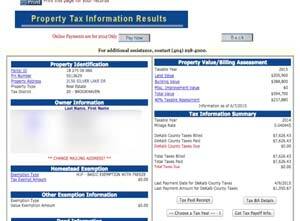 On the left-hand side of the DeKalb County Tax Commissioner’s website, click the Real Estate Data link, to open the Real Estate Data Search page. Enter your address to search for the description of your home. The best way to search is to enter the name of your street in the search box titled “Partial Street Name.” This will bring up a list of all the homes on your street which will be useful later. 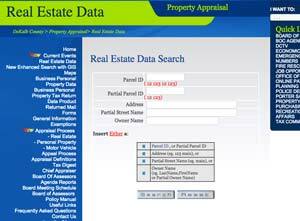 Click to select your address from the list of homes on your street and verify the accuracy of County’s description of your property. Check for errors in the description of your home. Check the square footage of your home, the lot size of your property, and verify all of the information is correct. If any of the information is incorrect, especially if it’s overstated, it may help your appeal. Verify you have been credited with any exemptions you are eligible to receive, like the Basic Exemption with Freeze or the Senior Citizens exemption, which can reduce your assessment. 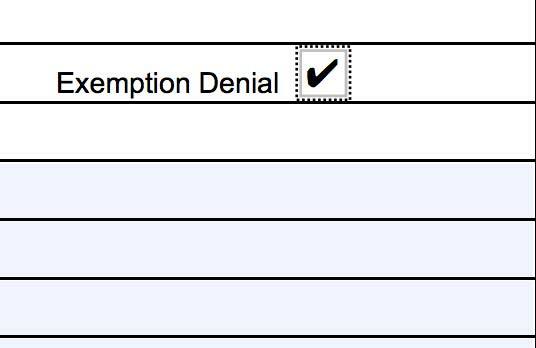 If you’re not receiving all the exemptions you’re eligible for, you can appeal on this basis by checking the “Exemption Denial” box on the 2016 Real Estate Appeal Form. You will need to show which exemptions you were denied. The Tax Commissioner’s website provides additional information, for example your Parcel ID, which is required when filling out your 2016 Real Estate Appeal Form. 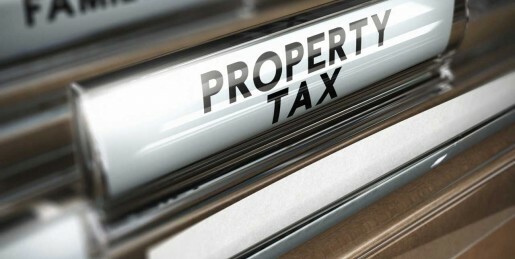 Other common reasons for appealing your property tax assessment are valuation and uniformity. The key to these appeals is documenting that your assessment is inconsistent with others. Valuation compares your assessment to the purchase price of similar homes sold during the Appraisal Year. The square footage of the house and lot size combined with the number of bedrooms and bathrooms are key to a valid comparison. Foreclosed homes are valid comps, but the assessors often neglect to include them. 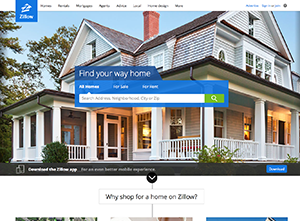 Zillow.com can be used to identify comparable sales during the proper time frame. Go to their website and search specifically for sales that were completed during the period for which your home is assessed. If your assessment is higher than recent sales of comparable properties, you’ll want to document the difference. Print out the comparable sales information from Zillow.com and attach it as part of your appeal with your 2016 Real Estate Appeal Form. Uniformity compares the assessed value of your home to the assessed value of other properties in your neighborhood. This is when the listing of all the homes on your street from the Tax Commissioner’s website will come in handy. If your value per square foot is higher than those of similar homes in your neighborhood, you’ll want to document this and include it with your appeal as well. Fill out your 2016 Real Estate Appeal Form, attach all supporting documentation, and mail it before the deadline. Once you’ve determined the basis for your appeal, fill out the 2016 Real Estate Appeal Form from the Tax Commissioner’s office, include a letter stating why you believe your home’s assessed value is incorrect, and attach all supporting documentation. Make sure you’ve signed and dated your paperwork and mail it to the address on the 2016 Real Estate Appeal Form. IF you’ve sent your appeal in before the deadline, you should receive a notice acknowledging your appeal and a decision by the Board of Assessments. Once you receive that decision, you can agree to accept it, and it will be the value used for your property taxes, or you can decide to appeal the Board of Assessments decision to the full board. Ernst Legal Group is your hometown solution for all your legal needs. We are headquartered at DeKalb-Peachtree Airport in Georgia. At Ernst Legal, we know what it means to give back to the community. That’s why 10% of our fees go to the charity of our clients’ choice. The attorneys at Ernst Legal Group have experience negotiating to get the settlement you deserve and in most cases avoid having to go through the traumatic and time consuming process of court. Fill out the form to the right and one of our associates will contact you.